The association of English Speaking Journalist were received on Friday, March 22, 2019 by the Prime Minister, Head of Government, Chief Dr Joseph Dion Ngute. The biggest association of Anglophone journalists in the country - the Cameroon Association of English-Speaking Journalists (CAMASEJ) - has sworn to support efforts at restoring peace and order in the restive North West and South West Regions. The commitment was made in Yaounde on Friday March 22, 2019, when a 13-strong delegation from CAMASEJ met the Prime Minister, Head of Government, Chief Dr Joseph Dion Ngute. 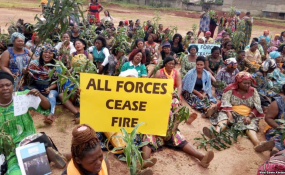 Led by the National President of CAMASEJ, Simon Lyonga, the English-speaking journalists told the Prime Minister they are not at peace because their backyard is on fire. "We are ready to contribute our own part in restoring peace," Lyonga declared. While addressing the journalists, the Prime Minister first recognized the importance of the delegation that was before him. "If you people had not taken the initiative to meet me, I would have invited you here." According to PM Ngute, what is happening today in the North West and South West Regions cannot be justifiable on any grounds. "There is no cause more important than bringing an end to this madness. All of our pockets are suffering because of the crisis," the Head of Government underscored. PM Ngute said the most critical thing at the moment is to get young armed separatists to leave the bushes, drop their weapons, and get rehabilitation. He told the English-speaking journalists that it would be in their best interest, and that of the country, to change the narrative. The Prime Minister urged the media men and women to take a stand and respond to separatists in the diaspora who are fueling the crisis back home. Last Friday's visit also turned out to be fruitful for CAMASEJ as the Head of Government promised to positively respond to some of the complaints raised by CAMASEJ. The Association had presented a plethora of challenges to the PM, including inadequate training, lack of advertising, low salaries, the absence of a status for journalists, access to information, amongst others. "I will give you the necessary push," PM Ngute promised.